The most sophisticated double-flowered lisianthus mix we've ever introduced. Rose Bouquet gives you extra strong stems, each loaded with elegant sprays of large, 4" wide, rose-like flowers in deep blue-purple, butter yellow and soft green. A captivating choice for long-lasting cut flowers right out of your garden. Lisianthus, Rose Bouquet Collection is rated 4.1 out of 5 by 14. Rated 1 out of 5 by cr3818 from Arrived dry and limp, many did not survive I bought these this spring 2018 and they arrived dry limp and worst of all - rootbound. They seemed to be past their transplanting prime, but I planted them all anyways with high hopes. Half did not survive transplant. Of those that did, their stalks were too spindly for their heavy heads. What a bust. Rated 5 out of 5 by K Ho from Beautiful Blooms I couldn't be happier with these. I've had beautiful fresh cut lisianthus in my home for several weeks now. The blooms are still showing no sign of slowing. 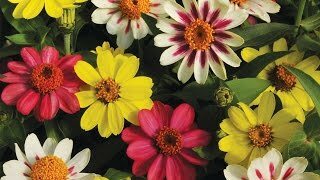 Rated 5 out of 5 by dmac68 from Great cut flower These are great performers as cut flowers. I planted these in spring in my cutting garden and am still cutting flowers in September. They have long stems (sometimes need to be staked) and a super long vase life. Rated 5 out of 5 by Carlea from Outstanding beauty all summer long. So happy to have the beautiful color in our garden. The cut flower lasts so long as well. Rated 5 out of 5 by Judy38 from beautiful flowers We received these plants in spring and now they are in full bloom. Absolutely gorgeous. Standing up to the CA heat. All of the plants (18) were in great condition upon arrival. Unfortunately none of the Lisianthus are available now, hope for next spring. PLEASE bring them back! Pricey, but well worth it. Rated 1 out of 5 by spottyma from Not worth the money! I bought this for cut flowers based on the height description, i.e., 30-40 inches. These plants are barely 12, maybe 15 inches and are not useful for cut flowers. The "green" isn't really any different in color than the cream/white color. The purple is a lovely color. Overpriced and disappointing! Rated 5 out of 5 by Baybie from Absolutely Beautiful Flowers!!! I ordered these flowers because we named our dog Lisianthus (Lisie for short)... I couldn't decide on a color, so I purchased this trio and I am so glad I did! They actually began blooming 3 days before he first birthday in July and I can't even begin to describe how beautiful they are! The green does look similar to the yellow, but in the correct light, you can definitely tell they are green. They were incredibly easy to care for and bloomed for quite some time. I couldn't have been happier and I would definitely purchase these again.